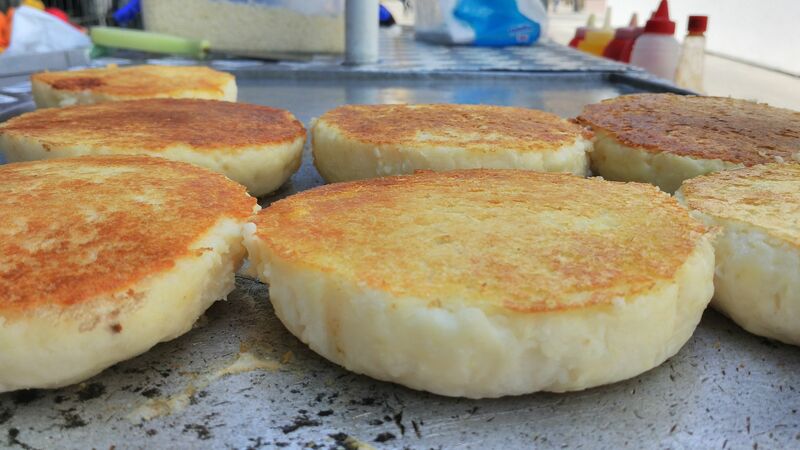 "The arepa, a thick, round, tortilla-like patty made from corn flour, is tradi­tional fare in every Venezuelan meal. People eat arepas for breakfast, lunch, and dinner and as a snack after a late night out. Venezuelans stuff arepas with cheese, pork, chicken, avocado, and a host of other ingredients, and they've given names to each variation, the most famous of all being the Reina Pepiada -- loosely, 'voluptuous queen' -- in honor of a Venezuelan who was crowned Miss World in 1955. Arepas are to Venezuela what hamburgers are to the United States, a part of the country's cultural identity. They also happen to be big business. Venezuelans make arepas from Harina P.A.N., a brand of flour so popular it is used as a neologism to refer to all corn flour, like calling all copy machines Xerox. The company responsible for such a successful product branding is Empresas Polar, a food giant that produces dozens of other products like mayonnaise, ketchup, and margarine, as well as the country's most popular beer brands and soft drinks. Polar also handles the bottling for Pepsi-Cola. Yet Harina P.A.N. has been the company's most emblematic product line for decades. Lorenzo Mendoza and his family own the company that began as a brewery in the early 1940s and has since grown to become the country's biggest private sector employer. The Mendozas also ranked number 690 in the 2015 Forbes list of the world's billionaires, with a net worth of US $2.7 billion. "Polar's Harina P.A.N. came out in 1960, and for the first time made it easy for Venezuelans to make arepas. Before that, making the staple was a labor intensive process that involved grinding corn into thick dough. Polar's flour just needed some water, and presto, the dough was ready. In 2015, however, Polar was losing money on every bag of Harina P.A.N. it produced. In fact, Polar began losing money on Harina P.A.N. in 2006, three years after Hugo Chavez imposed price controls on corn flour and other basic foodstuffs. In other words, the country's most emblematic food product produced losses for Polar for nearly a decade. "Manuel Larrazábal, the CEO for Polar's food unit, walked me through the numbers in a glass-walled conference room at Polar 's headquarters. The cost to Polar of producing a one-kilogram bag of flour was 16 percent higher than the price it could charge for the product. By Larrazábals estimates, the company lost US $13.7 million annually from the sale of Harina P.A.N. in Venezuela. 'This is the moment when we're losing the most money, no doubt about it,' he told me. The price for Polar's flour sat frozen for so long, and the government sanctioned price adjustments have been so meager, that the product has become almost worthless. 'They have turned arepa flour into the new gasoline,' Larrazábal said, referring to Venezuela's world-famous subsidized gas, the difference being that the state pays for the gasoline subsidy, but with Harina P.A.N., the money comes out of Polar's pocket. "Harina P.A.N. 's price of 19 bolivars (or ten U.S. cents) per bag, made the flour cheaper than practically anything for sale in Venezuela. For the price of a cup of coffee, a consumer could buy two kilos of Harina P.A.N., enough to make forty arepas. For a more mind-bending example, the price of an arepa with cheese sold on the streets bought four kilos of Harina P.A.N., enough to make eighty similar arepas in the first place. That's because the law does not regulate prices for a cup of coffee or cheese arepas, so they rise with inflation. To show the public its predicament, in 2015 Polar released a television spot pointing out these distortions. 'The effort of the Venezuelan workers who produce your favorite brand deserves a fair price,' the ad said. "Demand for Harina P.A.N. continues to rise because its low price makes it a target for smugglers but also because Polar's flour is the only brand Venezuelans seem to find in stores. Harina P.A.N. production usually sup­plies half of the 1,250 million tons of flour Venezuelans consume every year. But Larrazábal pointed out that at the time the latest customer pantry check surveys showed that more than 70 percent of households carried Harina P.A.N., which means Polar's share of the market dramatically increased. Polars competitors are producing far below capacity, and there's a very good reason for that: they are all controlled by the government. The state now owns eighteen corn flour industrial plants it seized from various compa­nies. The government also controls Monaca, a corn flour producer owned by Mexican tortilla maker Gruma that used to satisfy 2.0 percent of flour demand. Government-controlled plants are plagued by slowdowns, shut­downs, and the lack of raw material. To the government's embarrassment, Polar's Lorenzo Mendoza has often publicly asked president Maduro to let Polar run the flour factories the government can't seem to run on its own. Maduro has never responded to that offer. "Polar's competitors don't produce enough because they also lose money. Polar did increase Harina P.A.N. production capacity in 2014 because the state promised to raise the price of flour enough to make it profitable if Polar brought new capacity online. When the company did so in August 2014, the state increased the price of flour roughly 50 percent, making the product profitable again for the first time in years. But corn growers then demanded a price increase for their crop too, and two months later the state increased the price of corn -- Harina P.A.N 's main ingredient -- by 218 percent, mak­ing Harina P.A.N. unprofitable again. 'The only way to increase installed capacity is allowing for profitability. There's no other way,' Larrázabal argued."